It is always with great sadness and anger when I think, read about and see our fellow native Filipinos --the native (Malay) Filipino majority specifically-- who are hungry, landless and illiterate, literally just existing; and not living life; in our otherwise natural resources-rich country. And also always with sadness, sometimes coupled with anger at those who know and/or should know, realizing the historical ignorance of many among us natives who claim to be schooled/educated, exhibiting a curtain of ignorance of our true history. Therefore, a consequent failure to learn from the past, to repeat the mistakes of the past, to not see the forest from the trees. In our particular case, ignorance of the preconditions to the granting of our supposed national independence, a loudly proclaimed grant from our former colonial master, the United States of America. Strictly speaking, a grant is free, non-repayable to the grantor. But in this instance, the supposed political independence granted was not really a grant. As independence came with --still very few of us, native Filipinos know and understand-- the imposed preconditions (see NOTES below) then and now, in terms of its humongous, long-term real cost to our homeland and our fellow native countrymen... yesterday, today,tomorrow and in generations yet to come. And no small thanks for this state-of-affairs --a devastating legacy-- courtesy of our much revered triumvirate of Commonwealth politicians: Manuel Quezon, Sergio Osmena and Manuel Roxas. Our misplaced reverence for such a bunch of duplicitous and opportunistic political leaders. A triumvirate of native Filipino politicians who were, in retrospect, our poster-boys of traitorously adept manipulators of the common tao and greatly emulated by many of our subsequent/past and present politicians (we are not seeing statesmen here) in our greatly and disgustingly decayed Filipino politics. Below essay by Mrs. Leticia R. Constantino provides a basic narrative on the history of our independence as "granted" by the United States of America. REMEMBER WELL: political, not economic independence; i.e. from direct rule to indirect rule; from American colonialism to neocolonialism, was what we native Filipinos were "granted." We can further qualify that supposed political independence though. "Immediate, absolute and complete independence!" - this was the slogan raised by Filipino leaders like Manuel Quezon and Sergio Osmena during the decades of "peace time" following the ruthless suppression of the main mass resistance to direct American colonial rule. Those of us who do not have firsthand knowledge of that period would most likely be carried away by the brave words and take them at face value. We might even feel greatly indebted to the prominent Filipino politicians of those decades for raising high the banner of nationalism in accordance with the most cherished wishes of our people. But let us reexamine that period more carefully and objectively and let us ask this question: Did our leaders then really mean what they so passionately advocated in their election campaigns and in the various "independence missions" to the United States? We will find the answer by studying the nature of colonial politics under American rule as well as the contradictory attitudes toward Philippine independence exhibited by various sectors of American society. The Filipino people as a whole remains steadfast in their desire for independence. 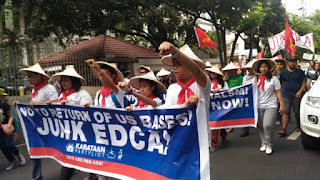 although the brutal suppression of their resistance, the effects of American education, the gradual grant of political autonomy by the colonial power and the latter's promise of independence finally led Filipinos to accept the idea that their freedom was to come as a grant from the United States, they wanted this freedom as early as possible. Therefore, only those leaders who pledged to work for "immediate, absolute and complete independence" could expect popular support. The electoral defeat in 1906 of the Progresistas (former Federalistas) whose platform called for "eventual" independence was an unforgettable lesson for all future politicians. 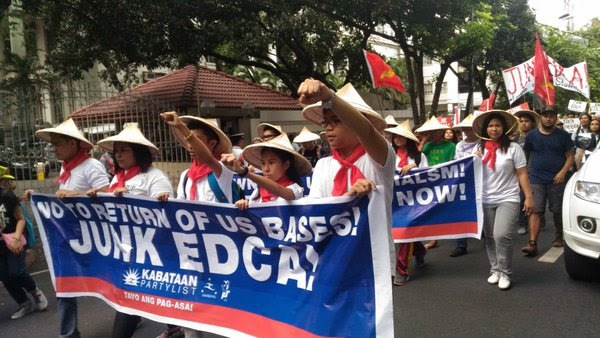 Unfortunately for the people, their revolutionary experience and the Katipunan's emphasis on political freedom from Spanish oppression and friar despotism (valid for its time) did not equip them to understand the economic objectives of US colonialism. Their own leaders, for reasons which will become clear further on, did little to enlighten them on this score. Hence, their desire for independence was focused on political sovereignty. They remained largely unaware of their country's growing economic dependence on the U.S. which would undermine the political freedom they sought. The second player was the United States. The American people had fought their own anti-colonial war against England. Sectors which retained this anti-colonial tradition were sincere anti-imperialists. Others had selfish reasons for objecting to the annexation of the Philippines. Racists dreaded contamination from an "inferior people." Labor unions feared the entry of cheap Filipino labor; farmers did not want competition from Philippine agricultural crops. Some businessmen believed that the Philippines could become a market for US goods without becoming a colony. Together these sectors constituted a vocal opposition to annexation. The advocates of colonization -- political and military leaders who wanted an empire, industrialists and businessmen who sought new markets for their products, new sources of raw materials, and new areas of investment --were more powerful. The Philippines was therefore annexed. However, American colonial policies toward the Philippines, including the various proposals to grant independence, represented a series of compromises between these two forces in American society. Most politicians came from the landed elite or represented their interests. The strict property and language requirements for voters imposed by the Americans in the first elections ensured that practically only the elite could vote and be elected to office (see SM-3). By the time qualifications were liberalized, political leadership was safely in their hands. Since most politicians were partial to landowners (who controlled the votes of their tenants and were also important source of funds for electoral campaigns), they did not object to the US policy of free trade which stimulated such export crops such as sugar, copra and hemp. As we shall see later, the fact that independence could end the duty-free entry of these crops into the American market was a constant preoccupation of our national leaders. The American policy of gradual granting autonomy plus the fact that the Governor-General retained the power of appointment forced Filipino leaders to cooperate with him since they were constantly asking for more prerogatives for themselves and government jobs for their political supporters on whom their own re-election depended. In view of all the foregoing, there was no real difference among the contending political parties and personalities of the period. They all had vested interests and career expectations to protect and cultivate within the political framework set up by the Americans. They all stood for independence, for as Manuel Roxas once admitted, Filipino leaders were forced to use "radical statements" for "immediate, complete and absolute independence" to "maintain hold of the people." While all probably wanted independence eventually, their primary concern was to secure absolute autonomy (which would mean more power for themselves) and higher quotas for Philippine agricultural exports to the US (which would mean more profits for landowners). Since all were birds of the same feather, they could easily switch from one party to another; parties could split and later coalesce. But whatever they did, politicians knew that the way to achieve their highest ambitions and remain at the top was to convince the people that they were working for independence. Top political leaders led the various independence missions. many of these missions were actually only begging expeditions for more autonomy; however, since each concession of power was presented as a step toward independence, the people hailed the missioners as the heroes of the hour. Thus was born the Filipino leaders' bad habit of campaigning for electoral votes in Washington and also the popular belief that we must elect leaders in the good graces of the United States so they can "bring home the bacon." The Jones Law of 1916 which promised to recognize the independence of the Philippines "as soon as a stable government can be established therein" was the go-ahead signal for the first of many independence missions. The top Filipino leaders, Manuel Quezon and Sergio Osmena, had been in favor of the Jones Bill since it was first submitted to the US Congress in 1912 because it would give autonomy to local officials. However, both Quezon and Osmena were against the Clarke Amendment to this bill which would have given the Philippines independence by 1920. This amendment was defeated when authorities of the Catholic Church pressured Catholic members of Congress to vote against it. At that time Quezon said that what he really wanted was an Act which would stabilize relations between the Philippines and the U.S. for 25 years. He admitted, though, that it would be hard to convince the Filipino people to approve of his idea. Yet Quezon's image in the Philippines was that of a fiery fighter for independence. When the independence mission of 1918 had to be postponed because the U.S. authorities had other matters to attend to (World War 1 had just ended), "Quezon, in a rage, talked of breaking relations with Washington, even starting a revolution; a mass resignation by the entire government was considered " Expectedly, the tempest lasted only briefly, because the Filipino leaders agreed to the delay. Quezon led another mission in 1922 and Roxas headed one in 1923 which asked that the US government recall Governor -General (G-G) Wood and install a Filipino G-G or grant independence forthwith. This was of course sheer bravado. President Coolidge ignored both demands and nothing happened. By 1924, Roxas was again heading a mission. This time, a number of independence bills were presented in Congress. One of them, the Fairfield Bill, provided for an elective Filipino G-G, a transition government and independence in 30 years. Incidentally, the Fairfield Bill directed that English remain as the medium of instruction. Quezon, Osmena and Roxas were in favor of the bill. In fact, Gen. McIntyre, Chief of the Bureau of Insular Affairs, claimed that he prepared the bill at the instance of Quezon and Osmena. But when popular sentiment rose against it principally because of the long waiting period, the three denied that they had accepted the bill's onerous provisions. To cover their tracks, they had the Philippine legislature pass a resolution demanding "immediate, absolute and complete independence." During the squabble on the matter, the missioners' fabulous expenses were exposed. Each had a clothing allowance of $900 plus stipends up to $90 per day. The mission spent $150,000 in 6 months. Contrary to their public posture, both Quezon and Osmena had begun to consider the idea of dominion status for the Philippines. In 1928, Quezon told G-G Henry Stimson, "Give us certainty and we will take dominion status" but "if you quote me on this, I will say you lie." Not only were these leaders afraid of losing electoral support, they were afraid of each other, as neither Osmena nor Quezon talked publicly of dominion status. If one of them ever dared, the other one would surely pose as the champion of independence and brand his rival as a traitor to the people's ideal. Quezon did attempt to test public opinion with a proposal to work for an autonomous government with free trade and a plebiscite after 10 years so the people could decide if they wanted absolute independence or the continuation of the autonomous government with the same trade preferences. Public opinion was against it. Osmena, though he privately agreed with Quezon, took the politically popular step of demanding "immediate, absolute and complete independence." Quezon's stand reflected the increasing reluctance of the Filipino elite to sacrifice their prosperous dependence for the uncertainties of freedom. Fully 80% of Philippine exports went to the US while american products accounted for 65% of Philippine imports. In the end, it was not the agitation of Filipino leaders that produced the "grant" of independence but pressure from powerful sectors in the United States. By 1931, the U.S. was in the throes of a severe depression which had started dramatically with the stock market crash of October 1929. Farm wages were the lowest in 30 years and farm sales had gone down 50%. For years, agricultural pressure groups had campaigned against free trade; they now demanded that their representatives in congress vote for independence for the Philippines as they could eliminate competition from tariff-free Philippine exports. Unemployment was high, so labor unions joined the clamor for Philippine independence to close the door to Filipino immigrant labor. Japan had invaded Manchuria in September 1931; many Americans wanted to get rid of their colony to avoid entanglement in any Far East conflict. Thus, the Osmena-Roxas mission of 1931 "succeeded" in securing the passage of the Hare-Hawes-Cutting Act (HHC). They were the heroes of the hour, something which Quezon could not allow. The issue of independence would become a political football one more time. Quezon opposed the bill declaring that under it "the Philippines would remain a conquered province of the U.S," that the provisions on the free entry of American goods would perpetuate our dependence, and that the retention of military, naval and other reservations was "inconsistent with true independence" and would "violate national dignity." Quezon succeeded in making the Philippine legislature reject the Hare-Hawes-Cutting Act. The legislature then appointed Quezon to head another independence mission. In 1934, the U.S.Congress saved his face with the Tydings-McDuffie Law. With minor changes, it was a word-for-word copy of the previous independence act. The big difference was that by bringing home the bacon himself, he was assured of becoming the president of the Commonwealth. Senator Claro M. Recto's description of the freedom we finally received was painfully accurate, "...a freedom which is only nominal, a freedom rendered unholy by mercenary motives, a freedom incarcerated on land and on sea by the powerful navies of a foreign power, in a territory which has been parceled out to alien hands their share in the most unequal transaction and the most ignominious surrender." Renato Constantino, A Past revisited, Quezon City, Tata Publishing Services, 1975. Teodoro A. Agoncillo and Milagros C. Guerrero, History of the Filipino People, Quezon City MALAYA Books, 1970. Joseph F. Hutchinson Jr. "Quezon's Role in Philippine Independence," in Compadre Colonialism, Studies on the Philippines Under american Rule, edited by Norman G. Owens, Michigan papers on South and Southeast Asia, November 3, 1971. Renato constantino, The making of A Filipino, Quezon City, MALAYA Books, 1969. Peter W. Stanley, The Philippines and the United States 1899-1921, Cambridge, Massachusetts, Harvard university Press, 1974. Also. you can freely download in pdf version the two out-of-print books (mentioned in a quotation at the beginning of post) : "Betrayal in the Philippines" and "The Untold Philippine Story" by Hernando J. Abaya. I suggest printing them to facilitate reading. Abaya had to flee our homeland in 1946 as he earned the ire of those in power during the Manuel Roxas regime when his first book -Betrayal- was published. PLEASE DONATE CORE/FUNDAMENTAL SUBJECT BOOKS TO OUR HOMELAND (i.e. your hometown public schools, Alma Mater, etc.). Those books that you and/or your children do not need or want; or buy books from your local library during its cheap Book Sales. Also, cargo/door-to-door shipment is best. It is a small sacrifice.